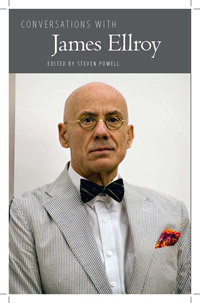 Ellroy: I’m going to write three more present-day L.A. police novels, none of which will feature psychopathic killers. After that, I plan on greatly broadening my scope. How’s this for diversity: a long police procedural set in Sioux City, South Dakota, in 1946; a long novel of political intrigue and mass murder in Berlin around the time of Hitler’s Beer Hall Putsch; the first complete novelization of L.A.’s 1947 “Black Dahlia” murder case; and the reworking, rethinking, and rewriting of my one unpublished manuscript—“The Confessions of Bugsy Siegel,” an epic novel about the Jewish gangsters circa 1924–45. As it happens Ellroy wrote two more ‘present-day L.A. police novels’ and only one of the other novels he mentioned came to fruition, but it would be one of his most powerful works of fiction – The Black Dahlia. Naturally I wanted this interview to be included in the book, and I contacted Duane Tucker to obtain copyright permission. However, Mr Tucker informed me that he had no recollection of conducting the interview and suggested Ellroy may have written it himself and used his name. Intrigued, I contacted Ellroy about this and received a reply from his assistant that ‘like his friend Duane Tucker, James has no recollection of the interview’. Ellroy and Tucker are close friends, and Ellroy dedicated his novel Killer on the Road to him. Armchair Detective is out of print now, but its editor in 1984 was the legendary Otto Penzler. I contacted Mr Penzler about the interview, and he was very adamant that a ‘fake’ interview would not have been published. His explanation was that Mr Tucker simply forgot about the interview as it has been nearly three decades. In the end I obtained the copyright without any difficulties, the interview was published in the collection, and I addressed the authorship question regarding the Tucker interview in the introduction. It’s not an unusual practice for authors to write their own interviews: Norman Mailer wrote one as a conversation between himself and a Prosecutor in court and the Guardian did a whole series on the subject back in 2010. However, in both those cases, the author is well established and the reader is on the joke. Could Ellroy have written the Tucker interview as a way of announcing himself to the crime fiction world in the early 1980s? As I say in Conversations with James Ellroy, there is no definitive proof that he did, but circumstantially there is enough to suggest that he may have done. For instance, throughout the interview the word icon is consistently misspelled with a k, ikon. This spelling has appeared in several Ellroy novels. Also, the introduction to the interview describes Blood on the Moon as ‘contrapunctually-structured’. This unusual term was coined by Ellroy to define how Blood on the Moon switches from the perspective of the detective to the serial killer and back again. Now if Tucker transcribed and wrote the interview, then why does it feature these conspicuous spellings which are so quintessentially Ellrovian? The more I read the interview, the more I found the interaction between Tucker and Ellroy to appear staged. However, I make no definite claims. It’s every researcher’s worst nightmare to be caught out, AN Wilson style, and there could just be a reasonable explanation for all this. Still, it’s a fascinating interview, and perhaps it gives us even better access into Ellroy’s mind as a writer than we previously thought. So, if you didn’t get the Christmas present you wanted last month why not pop over to Amazon.com or Amazon.co.uk and treat yourself to a copy?